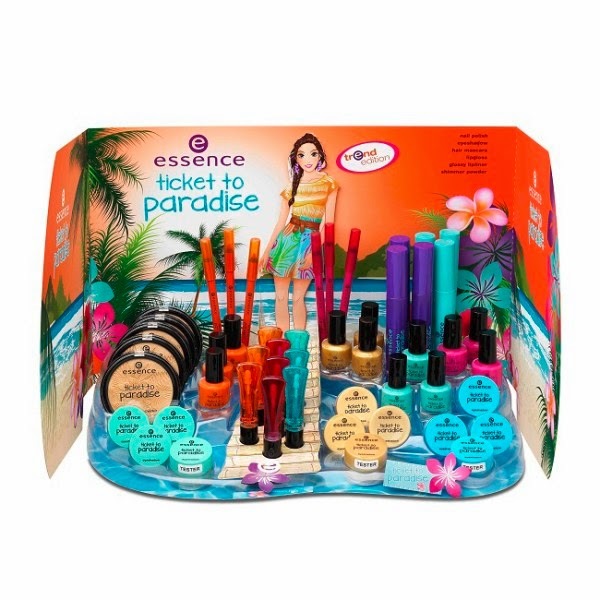 I was wandering around Priceline in one of the shopping centres in the eastern suburbs when the new Ticket to Paradise collection by Essence caught my attention. The bright colours of summer pulled me into buying a few things. I had read a post by Sophie from BorntoBuy talk about this collection in one of her posts in November and fell in love with all the products. You can read her post here. I could get hold of only a few of the products so I don't have the whole collection to show you. I bought the shimmer powder in 01 Tropical Heat which is a bronze gold highlighter. 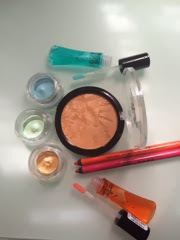 It is a beautiful highlighter especially for the summer. I love Essence Highlighters overall so this is no exception too. The two lip glosses I got are in 01 Sun said red which is a clear lip gloss with a teeny tiny hint of orange through it. On the lips it shows up clear. It smells exactly like the other Essence lip glosses, wish it was a little pigmented instead of completely clear. The other lip gloss I bought is in 03 Dive with me to the island which is a blue clear lip gloss with shimmer. This is a great lipgloss to top off a matte lipstick or to wear on its own because the shimmer looks beautiful and is not too overpowering. The glossy lip pencils in 01 Sun said red and 02 My Treasure Island are basically lip crayons in a thin pencil form. They glide on smoothly and do stain the lips a little. Since these are not matte they do keep your lips feeling hydrated and you can wear these on their own or under lip glosses. 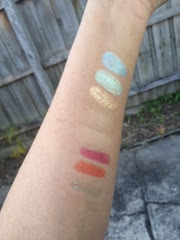 The cream eyeshadows in 01 Dive with me to the Island, 02 Deep Sea Baby and 03 Tropical Heat are gorgeous shimmery cream eyeshadows that look great on their own or use them as a base. They have a plush pillow like consistency and are super smooth. Over all I love the products of this collection. It is available at selected Priceline stores right now but by January most of the Pricelines in Australia will stock this trend edition. Have you seen this collection at your local Priceline yet?? ?